A new mom is always worried about her child’s height and weight. Babies enter this world in different sizes. It can depend on a mother’s health, genetic factors of parents and nutrition during pregnancy. Once the baby is born, pediatricians usually check the height, weight and head circumference of the baby to rule out any variations. Usually, boys are heavier and taller than girls. An average newborn baby boy should weigh 7.27 pounds and 19 inches long. The head circumference of a baby boy should be about 13.5 inches according to The National Center Of Health Statistics. 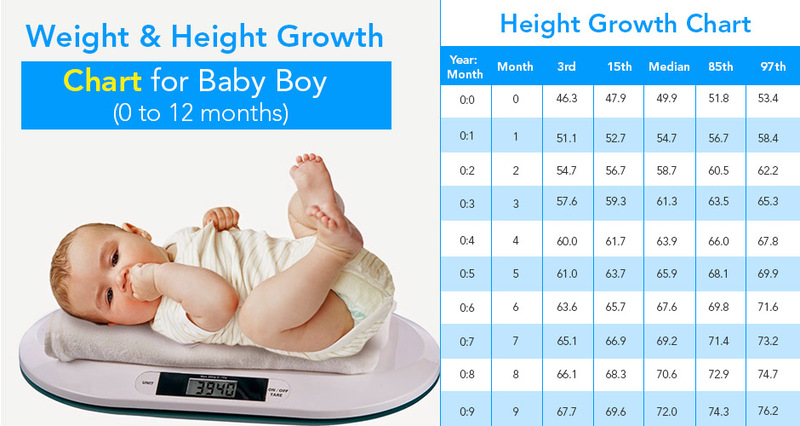 In this article, we will take a look at the weight and height growth chart for a baby boy. Newborn baby tends to lose weight in the initial days of life. Once breastfeeding is established, the baby will gain weight gradually. Babies generally get back up to their original birth weight within 10 -14 days after birth. A baby who is breastfeeding and is underweight usually has a latching issue. It means they aren’t getting enough hindmilk. During the first six months, people generally enquire about the physical development of the baby. A mom loses all her strength when someone asks her “Why is your child so thin?” It is a must for every parent to know the growth cycle to ensure if the child is on track. Being underweight or overweight may lead to illness and other complications. Always discuss with your pediatrician about your child’s growth and nutritional requirements. Please remember that the weight and height of the baby depends on the genetic factor also. Babies grow at a faster rate up to six months of age and their growth spurt reduces gradually. Alternatively, some are fast growing babies, while few are slow and steady gainers. A good weight gain is a sign that your baby is growing well, and meeting their early milestones for healthy development. Till 3 months babies gain about 175g to 210g per week. Doubles the birth weight by 5 months. For the remaining 1 year they gain about 400g of weight every month. 3 times the birth weight by 1 year. The height at one year age is one and half times more than that of birth. For Example, if the length of the baby is 50 cms it will rise to 75 cms at 1 year. This chart is provided by the World Health Organization to review the height and weight of the babies. All parents want tall and dashing sons. Society views tall boys as strong and confident. During his first year, your baby grows up to 10 inches in length. In this chart, the first two columns show the age. 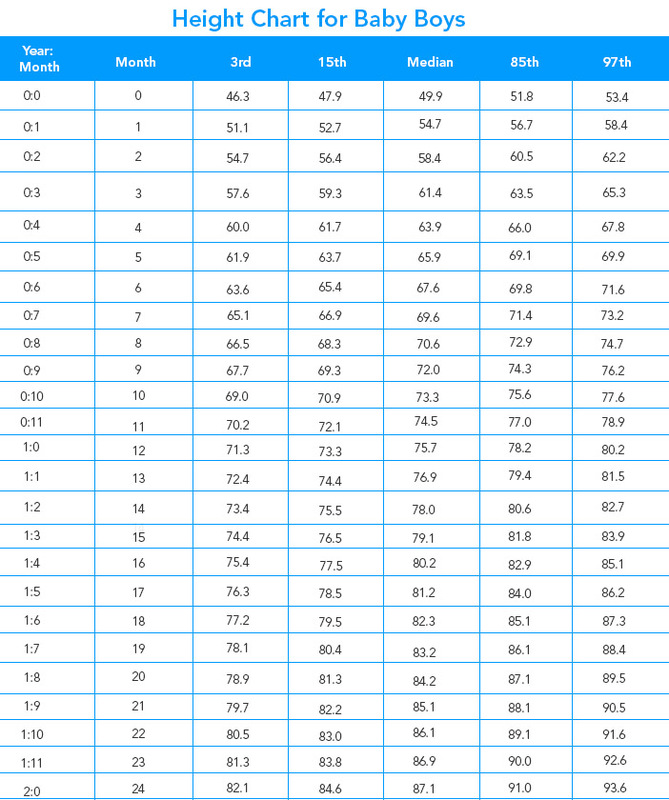 3rd column is the lower range of weight in baby boys’, i.e. in the 3rd percentile. It means 3% of babies will be below this weight curve. 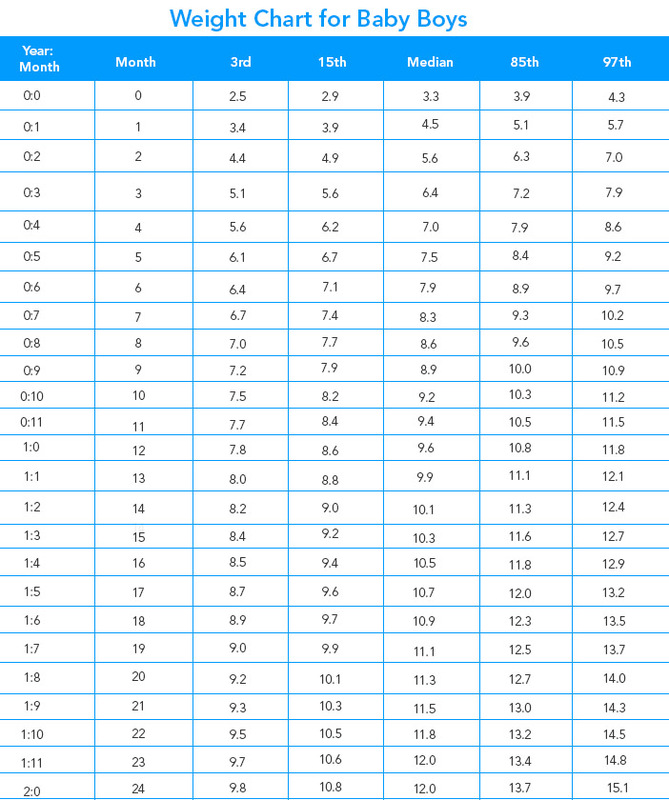 The second column is 15th percentiles, which mean 15% of babies will be below this weight chart. For example, a baby boy whose birth weight was 2.9 kg will be under 15th percentile and her optimal weight at age of 12 months in 7.9 kgs. There is no point comparing him with a baby who is following 50th or 85th percentile. Third column 50% of the babies is below this growth chart. The fifth column is 97%, which means only 3% of babies are above this weight chart. The length/height of a baby is based on genetic factors. As babies grow quickly, it is vital to concentrate on their nutrition for overall physical and mental growth. Babies grow pretty rapidly till they are six months of their age and would have doubled their birth weight by this point of time. He adds about five inches during his second year. Then, he will grow about two and a half inches per year of his life until a final growth during his teens. The height of the baby boy or girl is not always predictable and it is based on genetic factors as well. Also read: Why Is My Baby Not Gaining Weight? The percentile charts (shown above) is used to measure the baby’s weight. Babies who are on this range are hale and healthy. Sometimes their value is less. This may be caused by growth spurts, illness, and difficulty adjusting to solids or when they roll over or crawl. If you have any concerns about your baby’s growth, speak to your doctor. Don’t obsess with your child‘s weight and height always with the chart. If the child growth rate slows down, then find the cause of poor growth and give nutrition accordingly. Also, depending on the extent of calorie intake and calcium level, the height slows down or not in the same rate as shown in the chart. A steady increase in weight but not in height reveals that he may be putting more fat on his body. Good amount of play and exercise can bring balance in both. Don’t consider that the chubby baby is a sign of healthiness and never compare your child with the other one in the family or neighbourhood. As long as the baby is healthy and active, no need to worry about the height or the weight. Usually. boys’ heights increase during their adolescence period. Also read: 10 Baby Food Myths Busted!